Packing lunches is something that I’ve not really had to put much thought into; at least…not since I was in school…which was a while ago. The main reason for this is that I’ve always homeschooled my two boys. I don’t mean to imply that I’ve eaten every single lunch in the last 17 years with them, but for the most part we’ve always just worked around lunches and it hasn’t been too much trouble. That is…until they became teenagers.You see, when my boys hit a certain age, our homeschool routine just wasn’t enough for their quickly growing brains, bodies and social needs. We had to expand our routine to include some charter school classes. We started taking art and drama and violin and piano… and suddenly, my boys were all over the place at lunchtime and I quickly had to begin planning meals that both satisfied them and still met our fairly strict dietary specifics. The other issue that I discovered when planning lunches for teenagers is that the cute, fun and whimsical ideas in most of the school lunch guides out there are not really the kind of thing that they’re concerned with when they sit down to eat. Our family has been doing this “Real Foods” thing for about 18 years. It’s one of the ways that I was able to recover my mental and physical dysfunction because of a devastating eating disorder. Over the course of this time, there are a few things that Ben and I have discovered that are helpful to keep in mind, and helpful in keeping your sanity when it comes lunches. 2. Relax Your Ideals: Genuine health/allergy issues aside, don’t feel like every lunch has to be nutritional perfection. Don’t forget that you have both breakfast and dinner in which to load your teens up with all the nutrients they need. So ease off a bit for lunch or you’ll burn out in no time. As long as you’re not seriously compromising their health, I promise they’ll get what they need in the big picture. Do they need their lunch to be the most nutritionally dense packed food on the planet… not really. If that were the case I’d likely just send them to school with a thermos of beef heart, kale and anchovies smoothie. But what we’ve discovered over these 18 years is that there’s so much more than just nutrition to think about in this life. And I’m not talk about emotional eating (which is filling an emotional need with food.) I’m talking about living with a measure of freedom and abandon. 3. Delegate: If your teens aren’t already helping you make their lunches, put those suckers to work! I know that can be like pulling teeth at times, but the reality is, in a handful of years they’re going to be on their own and having to do this for themselves anyway. This is their chance to learn how to plan and prepare healthy, satisfying and enjoyable meals from a pro (you!). 4. Plan Ahead and Prepare Early: Definitely meal plan and make up what you can ahead of time. I like to make a few batches of waffles and tortilla dough to keep frozen or in the fridge so the boys can make a quick, easy sandwich if needed. Or I’ll make a few days worth of jello or chia pudding and such. Things like spiralized veggies are best made the day you are packing the lunch, but you can make up sauces and dips ahead of time. You could even plan sometime on the weekend and meal plan with your teens, then do some meal prep. Open a bottle of wine, delegate and watch your minions work….you know, like real chefs do. You can see all of their options on their website and you can save 15% between now and August 15th by using the coupon code URBANPOSER15. We’re also doing a giveaway for $100 in online store credit so definitely check that out at the bottom of this post. And if you’re looking for awesome stainless steel lunch containers, like the ones in the photo, you can check them out HERE. Its the ECOlunchbox 3in1, stainless steel. These are my absolute favorite. You can fit tons of food and they stack and clip together. The little jar I used for the dressing, I found it at The Container Store. Essentially it’s like the jars you would buy for making your own lip gloss. And it was under $1! Perfect for small sauces and dressings. But there will be more of these fun ideas in the e-book. So without any further ado, let’s dive into three of the e-book recipes. All of these are fairly easy to assemble so you can put your teens to work. Many of the recipes in the ebook will be accompanied by photo instructions, which you can see an example of at the end of the post. First up is BLT (Bacon, Lettuce & Tomato) Salad Skewers. Which basically consists of iceberg lettuce, Bacon and Cherry tomatoes (you could sub another veggie here). Now I know iceberg gets a bad rap for lacking nutrition. However, we love it. It’s fresh, watery and crisp, and remains so for some time. 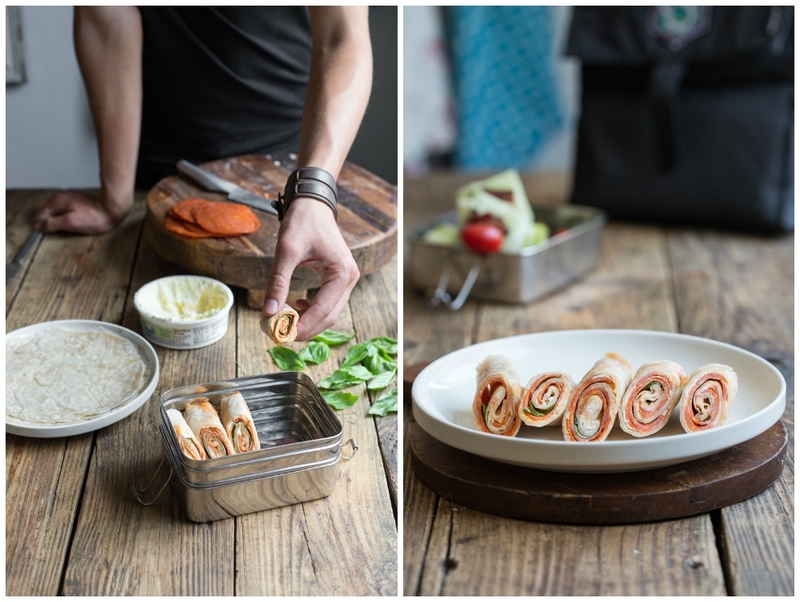 Then we have a delicious Pizza roll-up using my Cassava Tortilla recipe found HERE. You could also sub turkey lunch meat for the tortilla if you want a lower carb version. But I find my boys feel and function better with some carbs in their day. Finally a delicious healthy fat-packed, nut-free Coconut Macaroon Thumbprint cookie. Your teens will get their daily dose of coconut oil with this cookie and with only a minimal amount of natural sugar for taste and energy. *These recipes contain affiliate links…these are products I love…it’s cool. Place one of the tortillas on your work surface, spread about 1 tablespoon of cream cheese or other spread evenly over the surface. Then spread a very thin layer of tomato or pizza sauce. A super thin layer is all that is needed. Place the pepperoni slices, slightly overlapping down the center of the tortilla. If using, layer the basil leaves on top of the pepperoni. To roll, rotate the tortilla 90-degrees so that the pepperoni is horizontal and then tightly roll away from you until the entire tortilla is done. I like to spread a little extra cream cheese on the edge of the tortilla to “seal” the roll. Using a serrated knife, slice the roll at a 45-degree angle into 4 equal size pieces (see photos). **Note: For the cream cheese in the recipe I like to use the lactose free brand by Green Valley Organics. If nuts aren’t an issue I like the almond based cheeses spreads or ricotta by Kite Hill (exclusive to Whole Foods for the moment). I also like to make my own cultured cashew spreads when I have the time. I’ll have that recipe in the e-book..
BLT Salad Skewer w/ Ranch Dressing. For the salad: To clean the lettuce, simply cut off the stem and peel away a few of the wilted or browned outer layers. Using a sharp knife, cut the head of lettuce in half. You can wrap one half of the lettuce, to be used later. Now cut the half you are working with in half to make 2 quarters. Remove the hearts so there is just a shell of 4-7 leafs (this varies based on the head of lettuce). Holding the “triangle” end, make one cut that’s parallel to the stem side cut, approximately 1.5 inches in. Repeat so that you have two “strips” and one small triangle. Discard the triangle and cut each strip in half to make a total of 4 square-ish stacks of lettuce. Repeat with the other lettuce quarter. For the Dressing… whisk everything together in a small bowl. This serves 1 but the recipe can be doubled…tripled…whatever. Preheat the oven to 325 (163c) and line a baking sheet with parchment paper. In a medium sized bowl, mix together all the ingredients till well combined. The dough will be slightly wet and clumped together when squeezed in your hand. Note: Because the size of coconut shreds varies, you may need to adjust the amount of liquid or coconut to get the desired consistency. In this case, it is not a science. Using a 2 tablespoon scoop, fill and gently press the dough into the scoop. Tap it on a bowl or if using a mechanical scoop use the lever to release the dough into your hand or on the parchment. At this point the dough is fairly fragile and will need to be shaped and pressed together. Once the dough comes together you can start to create a “thumbprint” in the center. You will need to use your fingers to keep the shape on the outside of the cookie while you press in the center with you thumbs. Repeat with the rest of the cookie dough. Bake for 12-15 minutes or until slightly browned on the edges. Remove from the oven and cool completely before transferring. The cookies will be extremely fragile before they are cooled. But as they cool they will become sturdy. Using a measuring teaspoon, drop small spoonfuls of jam at the center of each cookie. Amounts needed will vary depending on the cookie or imprint size. Pro tip: If you want a jam that really sets well, you can do the method used for making Linzer cookies. Simply heat your jam (I just do it over a burner in a 1 cup metal measuring cup) till it is hot and liquidly. Then drop it by the teaspoonful into the center of each cookie. Leave it to set. I store these in the fridge for up to three days. Love these recipes! I agree that it’s hard to pack lunches (that’s why I created my website). As a grad student and then a professor who often eats cold food in my office between meetings with students, having some good lunch recipes helps. Will be making soon. 🙂 And excited about your ebook! Omg, I am SO EXCITED about this!!! I am going to have all four of my kids in public school this year and DREAD making lunches. I have a whole cabinet full of lunchbox supplies and a freezer full of ice packs and would loooove to consolidate. I would also love new ideas! So sick of making the same. exact. things. My kids are stoked too…you’re right, too, so many of these ideas are for little kids. Big kids need to eat too! Thank you thank you! This is great! We eat leftovers for lunch most days, but I struggle with lunches the one day we are out at our co-op. Especially #2. Thank you for the encouragement to relax a bit! I’m looking forward to your ebook and to trying these recipes soon. Oh my goodness!!! This post is perfect as this will be my first year sending gf lunches to school. Could you do an entire years worth of lunch box ideas? Lol! Just kidding! I love this… Thank you! I am a paramedical student and often go on internships where I like to bring my little cooler packed with Paleo lunch ? this cooler does sound more handy though!!! I don’t have Twitter though, I hope I still have a chance to win!!! Well you have 2 chances with Facebook and we’ll be adding bonus entires tomorrow, so check back! This is a fabulous post; finally lunch ideas for the middle school/high school crowd! I homeschool my two girls and there are days when I wonder why they insist upon a meal in the middle of the day : ) On another topic, I purchased your beautifully presented book at the beginning of the summer and it has been a joy to use. My oldest confidently turns out tasty cookies and my PICKY youngest says your icing actually tastes like “real” icing. Nothing but praise from this household. Thanks for the info on cassava flour! I will be purchasing this! Thanks for the giveaway! The “pin this image on pinterest” entry isn’t working – it says “oops! This image is invalid” when I try to pin it. And do you have recommendations for keeping things hot/warm (we’re on GAPS, so we have broth, etc.)? Can you put a Thermos inside a Packit? Thanks for letting us know! We’ll look into it right away. Some great recipes my boys will love, and I really love these lunchboxes! We have always had an issue remembering ice packs, and they’re just so bulky, or sometimes the food doesn’t fit into the container right. I love the idea of these! We homeschool, but often take trips around the city to nature preserves or museums and pack our lunches, so these would be perfect for that! No longer a teen:) but pack my lunch daily…and very much looking forward to your new ebook! Will be great for me…and great to share with patients in my primal eating program. Cheers! This is such a timely post!!! I have lots of ideas how I would use the Packit!! This will be the first year I have four attending school all day and packing a healthy lunch is a priority in our family! We also have practices three nights a week and I like to pack dinner to go, or nutritious snacks to tide us over until we come home for a meal! This is a great solution for my family! Thanks for the give away. This is awesome. I’ve been looking for an “adult” lunchbox. Perfect! I need new lunch bags for my kiddos badly. My goal this year is to get them to pack their own lunches. My sweet family gave me your book for my birthday and I just wanted to say I LOVE IT! every recipe has been a success and I love the pick and choose your topping/filling etc. You’re an inspiration and amazing at all you do! My sister and I were just talking about packing lunches for the school year. This post is very helpful! Thank you! Packit is truely amazing! Not only will it help keep my food cold, but I can keep my babies bottles in it while traveling. Great ideas. I’m always a mess when it comes to packing lunch!!!! Definitely going to try (but will do vegetarian)! I’m so glad you opened some new entries ?? now I feel like I have my chances!! All of these recipes look AMAZING and that bag.. I need it!! I’m actually about to pack my lunch for tomorrow ☺? ? This would help keep my kids gluten-free Paleo-ish lunches cool and fresh! Great ideas! We homeschool too but take trips to parks and field trips and whatnot! Thanks? This post is very helpful. This is my first year packing daily lunches and it is hard when you are trying to feed your family healthy, real food. These lunch bags look like a great choice and I am going to check them out. It would be more convenient not to have to insert ice packs along with the lunch containers and also have it stay cooler longer. I would love to give these lunch bags to my sister’s growing kids, they are entering teenhood and often pack their lunches. My husband could use one, too! I’m in my car all day so the size of my lunch bag isn’t much of a concern, but he needs something more portable for his daily commute on public transit. These is a great lunch system and we definitely need some new lunch bags! We homeschool but we do like to take a picnic lunch to the park so the ouch bags look great. The recipes are, as usual, amazing! Love the idea for the lunch boxes that have the built in gel. We are forever buying new ones to stick in the kiddos lunch boxes. Thank you for the great ideas! This is my daughter’s first school year since going paleo so I’m still trying to navigate lunches. Those tortilla rollups look tasty! I can’t believe how much your boys have grown, Jenni! Mine just turned 14 and is eating me out of house and home! LOL Lunch time has certainly become less stressful since we’ve been homeschooling, but like you, we have lots of extracurricular activities that often require a packed meal…and THEN, I STRESS! :p We invested in a PackIt last year when we saw them being sold at our local grocery store. It truly has been a godsend! Now I need to get these stainless steel containers to complete the packaged meal experience! 🙂 Love these recipe ideas and it’s time now, I invest in some cassava flour too! 😀 Looking forward to the ebook! Many blessings to you and your family, Jenni. We love these. They are especially helpful for carrying cold items on a plane as they are allowed through TSA security. You ate a genius, which I assume you know already. So glad I bought your book. Everything I have made of yours so far has been amazing. Great post! I bring lunch to work everyday and am always looking for ways to reduce the chemicals by my food and keep it cool. These look great! We already have one PackIt bag, and winning this would keep my husband and son from fighting over who gets it each day! Thanks for the great ideas would love a PackIt! Pack it sounds awesome! I wouldn’t have to worry about my kids losing their ice packs. I have a 5 year old starting his first day of Kindergarten in just under a month! These boxes look great- I don’t know what to pack that can sit in a locker all morning with no refrigeration!! I love that coconut macaroon recipe. My oldest (8) is very interested in doing things by himself in the kitchen right now and I am on the hunt for low sugar desserts! I seriously get anxiety when I think about packing 4 lunches every day for my kids when they go back to school. New ideas are always appreciated and I would love to get the PackIt lunch bags! Need to try these with all 5 of our kiddos and even myself. These look great. Love these ideas! My kids are not teens yet but I think they will enjoy these and I am looking forward to the ebook for more inspiration! Packing lunches for your kids (even for yourself or spouse) can be so frustrating when you aren’t prepared. As for the PackIt bags, we have one right now and love it but need a few more! Having 3 boys myself I can say lunch is crazy hard. Trying to get enough filling foods in, that can be consumed in the time they have. Gorgeous recipes and the lunch boxes look very practical. Can’t wait to try these ideas. I’ve been packing lunches for my three boys for the past 3 years and I have yet to find something that works great for us. I pack my lunch every day, as do my husband and daughter, and I would Love to get us each a Packit Deluxe Lunch bag to keep our lunches fresh and cold! Love these ideas! 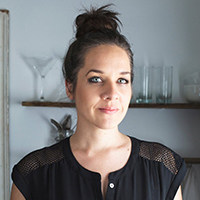 Thanks for all of the hard work you put into creating great recipes and fabulous blog content! My son will start preschool soon. He is allergic to most things. So this would be a lifesaver. The recipes look so good! I’m a college student and love the tortilla roll ups idea! No utensils needed! I bet a sweet version with some nut butter & chocolate chips would be delicious as well :D.
This would be great for my husband. He could use a new lunch bag. It would help my kids keep their lunches cool. These look delicious!Always good to have fresh ideas for lunches. I would love packing products, anything that makes packing our lunches easier would be helpful. We pack lunch almost everyday. The cold doesn’t last long with the setup we have now. These look promising!! Thanks for the recipes! These would be great for my fiancé. I think I will get him a lunchbox from PackIts because they are much more stylish and functional than those I have seen thus far. I would love a practical and cute lunch box as I pack my lunch most every day. I wasn’t really forward to starting to pack lunches for school again, but I myself start school as well as my children, so I suppose this is going to get interesting and fun. I have 2 boys myself. As they get older (they’re only 8 and 9 now), I would love to give them something cool to carry in school for lunchtime. And they’re bodies are constantly growing (my 8 year old grew more than 2″ in the past year), so healthy options to go are a must to keep them fueled not just for school, but for their hockey season starting September 9th!! This would be the perfect way to do so! Sounds so yummy. I am very excited about the ebook!! My son was really excited to meet you at the book signing yesterday. Thanks for talking to him! We’re both looking forward to this ebook. He’s starting middle school next week and I definitely need some help coming up with more ideas for substantial, health lunches that aren’t too “weird” or “kiddy”! I’m starting my third year of my PhD program in a week, which means I have to start preparing for my dreaded qualifying exams. I can’t get work done at home so I end up eating most of my meals on the go whenever things get crazy. The PackIt Lunchbag would be PERFECT for helping me carry all of the food that I need to stay satiated throughout long days. The recips and the lunch pack! Perfect! Like you, we home school. This year we joined a co-op one day a week. Has me stressing about lunch! My son was diagnosed with Autism and just got into an autism-based preschool program. He is gluten-free and can be a picky eater when it comes to textures and temperatures of food, so this lunchbox would really put my mind at ease with his food staying fresh and knowing that he will actually eat it since it stays cool. So looking forward to your ebook for great, healthy lunch ideas!! This sounds like a perfect solution for days when I need to pack my food and keep it cold!!! Looking forward to the ebook! Love this! Can’t wait for the ebook ? This all looks so good! We take our lunch every day during harvest and planting seasons! 3 girls going 3 different ways, this lunch box would be amazing for after school activity snacks! Awesome giveaway! Did all the steps! And so excited as my little guy starts school this year and I’ll be checking your blog like, every week for recipes, since we are trying to stay gluten and dairy free. Thanks for the fun giveaway!! This would be soooo helpful in preparing my kindergarteners meals. First time at this, I need all the help I can get!!! I just discovered these the other day and I really want one! But as a college student I don’t have the $ to just buy things on a whim. I’m thinking this may be worth it, though. I am a home health physical therapist. My paleo lunch has to stay in my car all day as I travel from house to house. I struggle with keeping it cold enough. I’m also pregnant and worry about my food being kept at the right temp. These lunch bags would be a lifesaver! I love that you did a post on a few lunch options for teens. I know my kids will love having a few new choices. Since we’re in the midst of back to school shopping and getting ready for a new school year this came at the perfect time. It’s always hard to find great lunch boxes that will keep everything cold and fresh. These ones look like an amazing option.